Seeing as how the lovely snow and sleet has kept me house bound the past 2 days, I have taken to reawakening a love of mine; Gilmore Girls. For those of you unfamiliar with the show, it is fast talking, witty and fun. I own 6 of the 7 seasons of what was once a favorite show on the CW (the WB when it started). Sadly, the 7th season had a different producer than the six that came before it and therefore was not nearly as wonderful or as easy to love. Gilmore Girls began in 2000 and stars Alexis Bledel as Rory Gilmore (daughter) and Lauren Graham as Lorelai Gilmore (mother). Rory and Lorelai live in fictional Stars Hollow, Connecticut, which is the perfect cookie-cutter small new England town. Gilmore Girls is filled with easy to love (and hate) characters that probably any viewer can relate to. It is more or less a growing pains kind of show that I grew very much attached to. To see Rory transition from high school to college right around the same time as I did was wonderful. If you have ANY desire to watch the show, please let me know. I will happily loan you any one of the six seasons that are in my possession. Seriously...I recommend it. "Set in a storybook Connecticut town populated with an eclectic mix of everyday folks and lovable lunatics, Gilmore Girls is a humorous multi-generational series about friendship, family and the ties that bind. 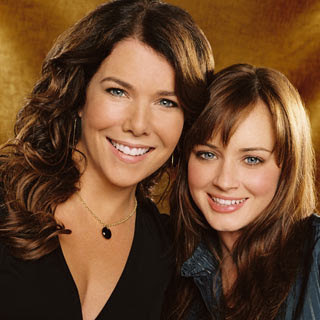 Thirty-something Lorelai Gilmore (Lauren Graham) has made her share of mistakes in life, but she has been doing her best to see that her college-bound daughter - and best friend in the world - Rory (Alexis Bledel), doesn't follow in her footsteps. The strong and loving mother-daughter relationship portrayed in Gilmore Girls touched users with its honest representation of a new type of American family."